Gun rights over gun control: Gun laws are unconstitutional under the 2nd amendment and they harm every individual and his/her right of self defense against violent criminals in the government or out. Topics include: firearms, shotguns, semi automatic or not, & ammo too, concealed carry laws; Gun groups and shooters' rights groups - RKBA, JPFO, GOA, SAF, NRA, the Libertarian Party, etc. Stop victim disarmament zones. They are the creations of the famous libertarian lawyer and artist, Dr. Rex Curry (author of "Pledge of Allegiance Secrets"). Tax Day April 15th is National "Buy a Gun" Day. Remember to buy a gun with your tax refund! 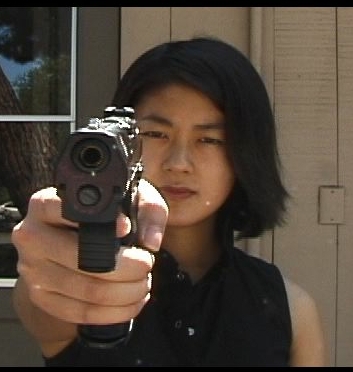 "The criminal charge in Wonschik had no allegation of violence and is a classic example of how the federal government is taking over criminal prosecutions from states and doing so by manufacturing jurisdiction with charges that do not address any actual act(s) of violence, nor any acts that are the actual origin of the case, but do so by criminalizing non-violent aspects in ways that arguably violate the 2nd amendment and the right to keep and bear arms (and the Commerce Clause), instead of leaving the state to pursue the intelligent charges involving any actual violence. The federal criminal charge in Wonschik involves the non-violent act of possession of gun parts. If the government’s antidisestablishmentarianism does not end, then we will be living in an even bigger police state." MOURNING 9-11-2001 -for the right reasons. Use this yearly letter to support the 2nd Am. THE CALIFORNIA DOG MURDER CASE - did gun-haters disarm and kill Diane Whipple? 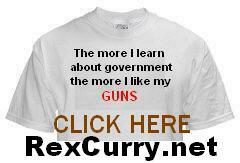 GUN-HATERS MURDER AGAIN - re-privatize government parks & stop disarming victims. SPEECH TO THE LIBERTARIAN ALLIANCE - Rex helps Londoners fight for gun rights. PLANES, GUNS, SEARCHES (& 9-11) - expanding the right to keep & carry arms. PILOTS, GUNS & YOU - government airports endanger your life & aid terrorists. LAWYERS JOIN PILOTS FOR RIGHTS - repeal laws restricting the right to carry. ON COMPROMISING GUN RIGHTS - settle for repealing only 50% of the laws (to start). JURY NULLFICATION - can jury veto and jury pardon protect the right of self-defense? GUN BUMPER STICKERS - Lawyers educate the public about the 2nd amendment (see below). 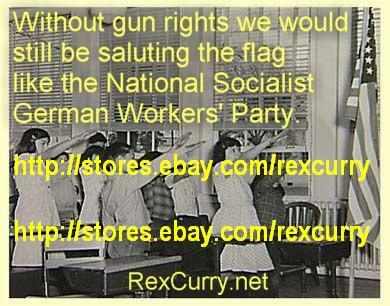 WITHOUT GUN RIGHTS - we'd still salute the U.S. flag with the National Socialist German Workers' Party salute. 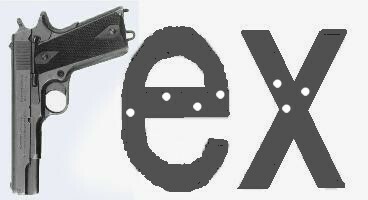 <---- enjoy this graphic art and then read Rex's famous poem "FIRST THEY CAME FOR THE ......" http://rexcurry.net/commentary/neimoller.html They are both about what gun haters do in victim disarmament zones. 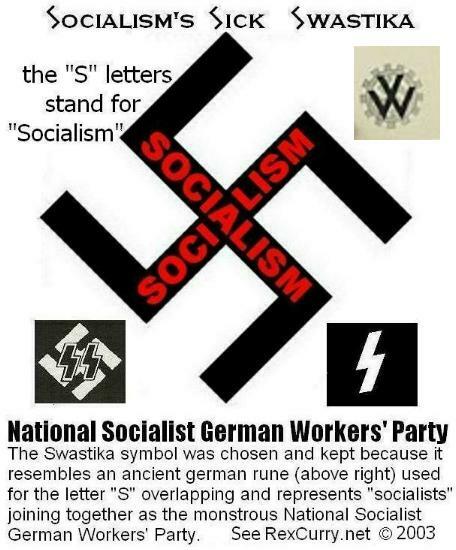 And we're not just talking about the socialist trio of atrocities. Gun cases have resulted in successful appellate cases at RexCurry.net. - gun returned after illegal carry charge is defeated. - another victory for liberty & peacful conduct. True salute http://rexcurry.net/pledgeofallegiance-salute-girlandgun-stiff-arm.jpg Right-arm salute, stiff-arm salute, or American salute of the 2nd Am. Stiff Arm salute, Right-arm salute, or American salute of the 2nd Am.